IC/FP Freeze Protection Valves - ThermOmegaTech, Inc. The IC/FP is installed into the NPT threaded opening with adequate internal clearance (see drawing at “Parts and Materials” on product sheet). When the water temperature approaches freezing, and freeze damage is imminent, the thermal actuator modulates the valve open. When the makeup water temperature returns to the safe range, the valve then modulates closed, minimizing water loss. Due to the sensing element, the thermal actuator, always being wetted this valve is unaffected by ambient air temperature, and opens only when the water is in danger of freezing. 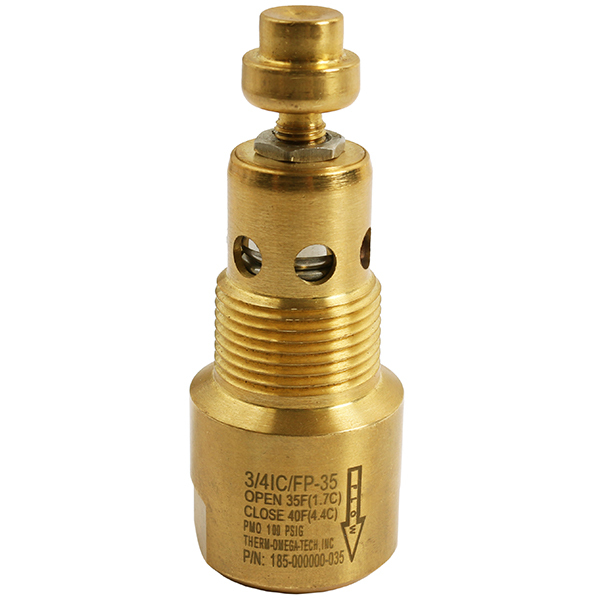 Typically the valve opens below 35°F (1.7°C), and closes at 40°F (4.4°C). Relying on having to manually open valves for freeze protection allows for human error or plugging of partially cracked valves. This annually accounts for large amounts of freeze damage resulting in huge monetary losses including repairing damaged equipment, piping, as well as system downtime. 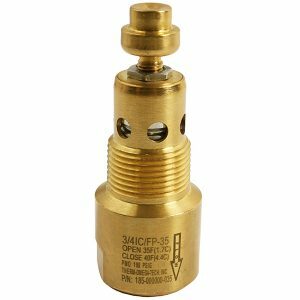 The self-actuating IC/FP valve eliminates the human errors associated with manual valves. The automatic IC/FP valve is ideal for the protection of piping, safety showers, solar collectors & piping, condensate systems, fire lines, spray nozzles, or as backup protection on traced systems. Its sensitivity to water temperature makes this valve ideal for applications where water conservation or wastewater disposal are a prime concern.